KESWICK, Ontario (BRAIN) — The Canadian government announced earlier this month that it would eliminate tariffs on several categories of imported goods, from baby clothes to skis and snowboards to golf and hockey equipment. LUDHIANA, India (BRAIN) Monday April 16 2012 7:57 AM MT—A proposed 20 percent increase in duties on bikes imported into India from China stands to raise retail prices in that emerging market, according to local media reports. BRUSSELS, Belgium (BRAIN)—The European governing body officially renewed anti-dumping duties today for bikes imported from China at 48.5 percent for the next five years. LAGUNA HILLS, CA (BRAIN)—The European Commission is recommending that anti-dumping duties on Chinese bicycle imports into Europe continue for three years. WASHINGTON, D.C. (BRAIN)—The House of Representatives passed a miscellaneous tariffs bill on Wednesday that would extend temporary duty suspensions on bicycle tubing, speedometers, road and hydraulic disc brakes and certain rims and cranks. PETALUMA, CA (BRAIN)—CamelBak Products LLC has lost a case that sought to reclassify hydration packs imported from the Philippines in 2003 as "insulated food or beverage bags" that would have lowered duties more than 10 percent for the company. FRIEDRICHSHAFEN, Germany (BRAIN)—Even though talks over a comprehensive global trade agreement have faltered, Taiwan is encouraging countries to eliminate tariffs on bicycle imports. 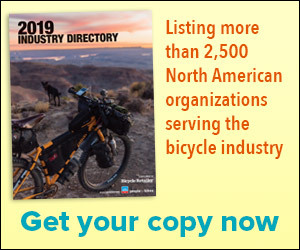 OTTAWA, Quebec (BRAIN)—The Canadian government has extended its anti-dumping duties on low- and entry-level bicycles from China and Taiwan for another five years, but will drop the extra duties on frames priced at less than $50, FOB China and Taiwan.